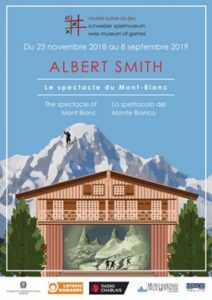 The incredible story of Albert Smith (1816-1860), English lover of the Mont-Blanc, adventurer and above all a showman, is awaiting you at the Swiss Museum of Games! After several trips along the shores of Lake Geneva to Chamonix, Smith staged an unprecedented succesful show in London. To maximize profits, he developed a large number of “merchandising” products, mainly in form of games, highlighting the clichés about Switzerland with great humor. Thanks to his inventiveness, Smith helped to popularize trips to Switzerland within Victorian Britain. An exhibition in collaboration with the Museo Nazionale della Montagna in Turin. The rise of Mont Blanc, what an adventure! In the 19th century, the Englishman Albert Smith tells of the rise of Mont Blanc and his adventures in the form of a game. Inspired by Smith’s model, children can create a game.